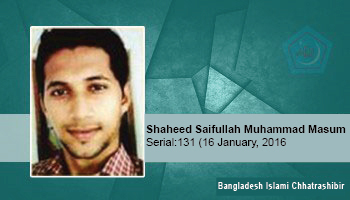 Saifullah M Masum was the youngest child of retired government employee Mahtab Uddin Ahmed and Shamsunnahar Rubi. On 28 October 2006, Awami League cadres hammered his whole body with bricks and sticks. After 5 days of struggle with death he succumbed to the injury and died on 2nd November 2006.